What is a propped boulder? Propped boulders are supported with one, two or more stones placed under them to mark them as having been positioned by man. If more than two were used, the boulder is usually lifted above the surface, with a gap separating it from the ground or bedrock. If elevated above the surface, they are often referred to as dolmens. While it is probable some of the propped boulders are natural creations as a result of glacial action, most were done by man. Close inspection should be given to the propping stone(s). If they do not show evidence of having been glacially tumbled with resulting rounded edges, consideration must be given to the possibility that it was positioned. If the propping stones are rounded, this by no means rules out the possibility of this being an artificial construction. What is a dolmen? Strictly speaking, a dolmen is a European megalithic tomb, constructed with a flat, table-like capstone resting on uprights and then buried within a cairn of smaller stones or covered with earth. The term dolmen has been applied to propped boulders found in N. America (especially those examples which are fully elevated), but this is not strictly correct. The word means 'table' in Gaelic, from the flat slab placed across supporting pillars of a structure which apparently was mainly used as a sepulture for a person of high rank and then buried under a cairn of stones. The stones of the cairn have usually since been removed for local recycling, or the earthen cap has eroded away, leaving the interior construction in plain view. In North America the supported stone is normally a rounded boulder, in Europe, it is a flat slab. Probably the most well-known example of a propped is the almost 100-ton elevated boulder in the center of North Salem, NY in northern Westchester County. The boulder is a pink-tinged gneiss or granite, and rests on supporting marble standing stones of a white color. A roadside sign adjacent to the boulder long maintained the stone was a glacial erratic. In recent years, the possibility of it being a Viking construction has also been added to this sign, despite the fact that Vikings never did this sort of thing or of any evidence they settled as far south as New York. The possibility of the stone being a Native American creation has largely escaped consideration. ". 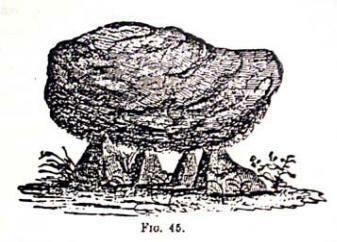 . . a very remarkable rock, supported by five others, as shown in the following wood-cut, Fig. 45. From its entire correspondence with the Celtic cromlech, this has attracted some considerable attention." -E.G. Squier, Aboriginal Monuments of the State of New York; Smithsonian Contributions to Knowledge, Vol. 2, 1849. The supporting marble standing stones are embedded in what appears to be an artificial terrace. These supports did not decide on their own to plant themselves in the ground. The boulder is an effigy of a cat or some other carnivore. The use of a pink boulder and white supports was done to underscore the lunar focus of this creation. White and pink/orange are both associated with the moon, the former is its color when well-elevated above the horizon, the latter when it is near the horizon. The moon's extreme rising/setting points along the horizon occur in an 18.6-year cycle. At the extremes of this cycle, known as the major lunar standstill, the moon will rise and set well outside the band the sun traces along the horizon during its annual migration. (At the latitude of the North Salem boulder, this translates into about 7° outside the solstice points of the sun.) 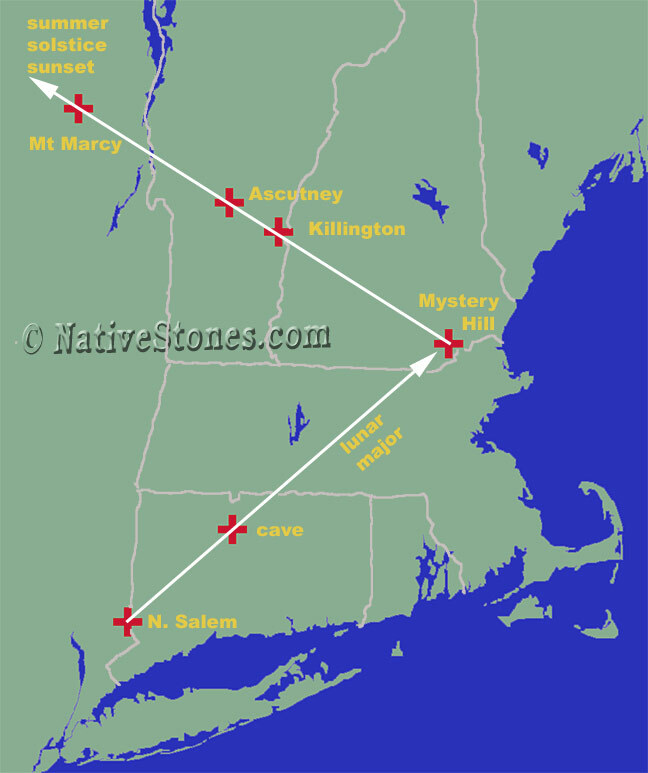 From the boulder, the moon's northernmost rising, when run out across the landscape, intersects both King Phillip's Cave [an artificial cave burrowed into the western side of Talcott Mountain in Bloomfield, Connecticut] and Mystery Hill, the massive stonework complex in New Hampshire. Mystery Hill is itself carefully positioned in the landscape. It lies along a unique alignment of three significant mountain peaks. From Mystery Hill, heading toward the summer solstice sunset, a straight line intersects the peaks of Mt. Killington, Mt. Ascutney and finally Mt. Marcy. Mt. Marcy is the highest peak in New York state, and at 5,344 feet is the highest elevation in the Northeast outside the Presidential Range in New Hampshire. Over the course of many generations, the Native inhabitants of North America obtained a complete understanding of the landscape. Such a unique solstice alignment between mountain peaks would have neither gone unnoticed nor unmemorialized. Propped boulders fall into one of two categories: distinct, separate stones outside the bounds of a surrounding stone complex, and those which reside within a complex which typically includes some or all of the components typical of such sites, including walls, cairns, wells, chambers, etc. The North Salem boulder is an example of the former, erected as a Native benchmark to trace out a massive sacred pattern across the landscape. Too long a subject to explore here, the Natives of the East laid out long distance sacred alignments between various features of the landscape and the sky. The Anasazi did the same, establishing what is today a well-studied network of sacred roads, some running hundreds of miles across the Southwestern landscape. The size of the boulder which was propped correlates with the length and significance of the alignment it served to memorialize. The longer and more important an alignment, the larger the boulder. While most common in the Northeast, propped boulders (which serve as benchmarks along these sacred spirit paths) are apparently found across the breadth of the continent, including areas which were never glaciated. Some can exceed 100 tons in weight. How were they constructed? As experiments prove, one person can easily manipulate over 10 tons alone. 100 tons is well within the realm of what other ancient civilizations throughout the world are known to have moved and lifted. In the northern part of this continent, the use of ramps made of packed snow and ice would have made this task much easier. Massachusetts- Little Agassiz Rock, the propped boulder that spawned the modern theory of glaciers. New Jersey- Tripod Rock, one of the more spectacular propped boulders of the Northeast. New Jersey- This pedestaled boulder apparently rests on quarried stones, although the resolution of the photos makes this difficult to discern. Fun link: the fine art of stone balancing. More HERE. © Copyright 2006, NativeStones.com. All rights reserved. All original materials on this site are protected by United States copyright law and may not be reproduced, distributed, transmitted, displayed or published without prior written permission. You may not alter or remove any copyright notice from copies of the content. You may download material from this site only for your personal, noncommercial use.